Algae ponds covering an area the size of Sydney could satisfy the entire crude oil demand of Australia, according to a recent study from Australian researchers Bojan Tamburic and Arunima Malik. But some form of government support is critical to bring the technology up to scale. Ultimately, all of the oil we use to power our modern lives comes from living creatures such as algae – albeit ones that lived 3.5 billion years ago, before gradually morphing into fossil fuel. But when we talk about algae biofuel, we mean the green, renewable and sustainable version, rather than traditional fossil crude oil. The main requirements for making algae biofuel are: lots of sunlight, plenty of space, and easy access to the sea. Australia is an algae gardener’s paradise. To scale up any new technology, we need to consider not just whether we can make it, but also whether it is worth doing. Unfortunately, this involves rather dry concepts like productivity, efficiency, energy balance, and supply chain dynamics. These are critical to the development of business models for new technologies, but sadly they don’t translate easily into language that politicians are interested in. In the absence of a benevolent billionaire, the private sector is unlikely to take on the risks involved in bringing these emerging technologies to scale. This means that some form of government support is critical. With renewable energy investment growing ever more politically contentious, what are the incentives for spending scarce taxpayer dollars on something like this? In our recent study, we put algae biofuels under the cost-benefit microscope, to assess the viability of developing a full-scale algae biofuel industry in Australia. We used a technique called hybrid life-cycle assessment (LCA), which aims to evaluate all of the effects throughout the myriad supply chains of an industry – even one as huge and complicated as the oil industry. The results are striking: a large-scale algae biofuel production facility would create almost 13,000 new jobs and A$4 billion worth of economic stimulus in Australia. It would generate a total economic stimulus of 77 cents for every dollar invested, compared with just 13 cents in the dollar for traditional crude oil exploration and extraction (see table 1 in our paper). 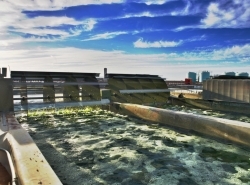 Commercial algae biofuel production is now a challenge of scale. The prize is phenomenal. Algae ponds covering an area the size of Sydney could satisfy the entire crude oil demand of Australia, which would do wonders for both sustainability and security of supply – currently, 82% of crude oil is imported (see table 2 here). We know that large-scale algae cultivation is achievable. The largest algae facility in the world is at Hutt Lagoon in Western Australia, where 740 hectares of algae ponds are used to produce the food supplement beta-carotene. Meanwhile, the US federal government has been backing various large-scale algae projects, including Sapphire Energy’s expansion plans in New Mexico. However, the technological risks are significant, which is where hybrid LCA comes in. We used hybrid LCA to established a hypothetical case for assessing the viability of algae biofuel production in Australia. First, we identified a rural region in WA with the attributes needed to sustain an algae biofuel industry. Next, we used cloud computing to develop a hybrid LCA model for this region. For the first time, we integrated multi-regional economic input-output data for Australia with engineering process data on algae biofuels. This allowed us to quantify comprehensively the employment, economic stimulus, energy consumption and greenhouse gas emissions of the algae biofuel supply chain, not just at the site itself, but throughout the supply chain. Our analysis shows that algae biofuel facilities would create local rural jobs, while also activating sectors of the broader economy associated with equipment, trade and business services. Then there is the environmental benefit: our study shows that the combustion of 1 tonne of algae oil instead of traditional crude oil would prevent the emission of 1.5 tonnes of carbon dioxide. Investing in algae biofuel production is environmentally, economically and socially sustainable, and will provide a much-needed stimulus to the economy while creating much-needed quality jobs in rural areas. Surely every politician would be persuaded by at least something on this list. Bojan Tamburic is Chancellor’s Postdoctoral Research Fellow at University of Technology Sydney. Arunima Malik is PhD candidate at the University of Sydney. This article was first published on The Conversation and is republished here with permission. In an email, Tamburic notes that with regard to Europe, “space is a lot more limited than in Australia and the growing conditions are generally not as good. While Australia and the USA can pursue algae biocrude as an absolute replacement for crude oil, a more targeted strategy towards e.g. algae jet fuel makes more sense for the EU”. With regard to the US, according to an article published on 30 July by Paul Lester of the US Department of Energy, “3 Reasons we’re closer to an algae future than you think”, algae “have big potential for America’s clean energy future”. Lester writes that “production is up”, “logistical problems are being solved” and “algal biorefineries are scaling up – big time”. He notes that “researchers at the Scripps Institution of Oceanography genetically engineered algae to boost the amount of energy-storing molecules essential for making oil, signaling a breakthrough in algal biofuel production”. Such an opportunity for the sake of coming generations should not be ignored. Great concept it is.